McLogan Supply is excited to announce that they have been selected as authorized distributor for the launch of the new Roland’s SOLJET Pro4 XR-640 large-format printer. This is a game changer for highest quality vehicle wraps, banners, posters and backlit displays, large format signs, photos and fine art. 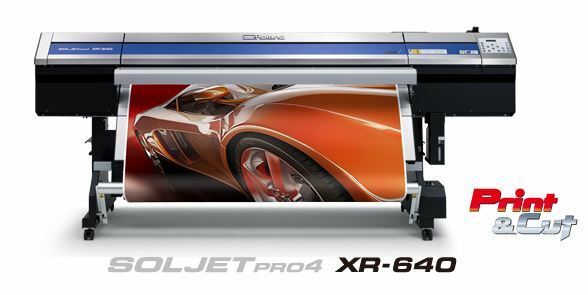 The Roland SOLJET Pro4-XR640 is the sure fire printer to meet all of your large and high resolution design needs. The expert team at McLogan specializes in equipment and supplies for digital printing, sign making and vehicle wrapping and offers factory trained know how for getting started with the Roland Pro4 as well as follow-up support. With its two inline, mirrored printheads, integrated printing and contour-cutting technology, and new, environmentally-friendly Eco-SOL MAX 2 inks, the Pro 4 XR-640 large-format printer delivers both greater productivity and unsurpassed image quality printing up to 720 x 1440 dpi. Whether the job required is a signage or a complex vehicle wrap, this machine does the job and does it well. With a 64-inch base, the Roland Pro 4 can handle jobs large and small with ease. Roland described this printer as “production perfected”. The perfection delivered from this printer brings a sketch or photo to life with unsurpassed clarity rendering exquisite detail and stunning color. Up to eight colors can be printed in one design using the Roland SOLJET Pro4. Metallics are easily printed as well if you want to give your design some extra pop. It prints up to 528 square feet per hour making even the biggest jobs fast and easy. A key feature of this large format printer is that it can print on coated or uncoated surfaces. Another distinguishing feature of this large format printer are images can be rendered beyond realistic. Every detail of a face and every pixel in an image are seen clearly. Aiding in the clarity and precision of each image is the dual mirrored print heads. Not only are high-definition quality projects produced but also the machine is nickel free and produces virtually no odor. A feature that is totally unique to the Roland SOLJET Pro4 XR-640 is the light black ink for seamless graduations. With light black, you achieve neutral gray for smooth gray scale gradations and precise photographic images. This renders beautiful variations in skin tones and makes colors more vivid. If that is not enough to catch your interest, the machine is easy to program as well. For those starting out, this new era of printer may seem daunting to use at first. No worries…McLogan is always there when you need support. Their equipment experts can help you to with everything from setup to understanding a technical mishap that can be fixed over the phone with their guidance. McLogan is a family owned business, founded in 1922, on the principle of putting customers first. Their winning combination is offering high quality products and personalize service to their customers…that’s why we have been around for 90 years. For more information about the Roland SOLJET Pro4 printer or any of our other large format printers, give us a call at our Los Angeles location! Join us on Facebook! Indeed a very nice post. I am also associated with imaginationworksla, vehicle wraps los angeles, car wraps los angeles, Banner stands los angeles . Thanks for writing such good posts and as I have subscribed to your blog, I do expect that you will be posting nice posts like this on a regular basis.